Identification: Sigler and Sigler (1987); Hubbs et al. (1991); Page and Burr (1991); Pflieger (1997). 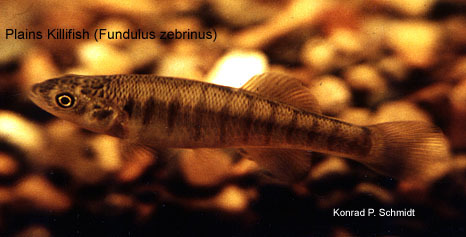 Fundulus kansae is considered a junior synonym (Poss and Miller 1983). Native Range: Mississippi River and Gulf Slope basins from north central Missouri to central Wyoming, and south to Colorado River, Brazos River, Galveston Bay, and Rio Grande (primarily Pecos River) drainages, Texas. Mostly on Great Plains (Page and Burr 1991). Table 1. States with nonindigenous occurrences, the earliest and latest observations in each state, and the tally and names of HUCs with observations†. Names and dates are hyperlinked to their relevant specimen records. The list of references for all nonindigenous occurrences of Fundulus zebrinus are found here. Means of Introduction: Most introductions apparently originated from bait bucket releases. In western Colorado, the species may have been introduced by bait bucket transfers or accidentally stocked as a contaminant with other species, although upstream expansion from Utah cannot be ruled out (Woodling 1985). It possibly spread downstream into the Big Horn River of Montana from Wyoming (Brown 1971). The species has been introduced widely since about the 1930s (Poss and Miller 1983). Status: Established in many areas of the Colorado River above and below Glen Canyon dam (Poss and Miller 1983). Presumably established in other localities mentioned. Remarks: Poss and Miller (1983) discussed the introduction history of this species and provided a dot distribution map distinguishing native and introduced records. According to Lee et al. (1980 et seq. ), many records represent natural occurrences (e.g., the Yellowstone River drainage records in Montana and Wyoming, the Cheyenne River records in Wyoming and South Dakota, the non-Pecos records in the Rio Grande Basin in Texas); however, Poss and Miller (1983) concluded these populations were introduced. Holton (1990) found the species to be more widespread in Montana than previously thought, inhabiting the Little Missouri and Yellowstone drainages and the Fort Peck Reservoir area; thus, he suggested that the species may be native to the state. Tyus et al. (1982) gave a map showing its distribution in the upper Colorado basin. The Plains Killifish has never been collected in North Dakota (Steinwand, personal communication) even though it has been collected in the Yellowstone River in Montana near the Montana/North Dakota state line (Elser et al. 1980). That area of western North Dakota has been intensively surveyed (Steinwand, personal communication), so it is not likely that the species was overlooked. Hughes, R. M. 1981. The plains killifish, Fundulus zebrinus (Cyprinodontidae), in the Colorado River basin of western North America. Southwestern Naturalist 26(3):321-324. Miller, R. R., and C. H. Lowe. 1967. Fishes of Arizona. Pages 133-151 in C. H. Lowe, editor. The vertebrates of Arizona, part 2. University of Arizona Press, Tucson, AZ. Poss, S. G., and R. R. Miller. 1983. Taxonomic status of the plains killifish Fundulus zebrinus. Copeia 1983(1):55-67.